The Untold Story of Billy Howard - Part 2 - LFChistory - Stats galore for Liverpool FC! Last week we introduced you to Billy Howard, an ardent Kopite who also had the pleasure and privilege to be on Liverpool Football Club's books. Part 1 can be found on the right-hand side of this article. When we left you Billy was struggling with ankle injuries. A new dawn was upon Liverpool FC as Bill Shankly was taking over. We hope you will enjoy reading this article as much as we enjoyed interviewing the gentleman that is William Howard. I return to Melwood felling stronger and fitter. However, I still have constant pain in my foot and swelling after training and games. Anyway, the season starts and I’m selected. The first game is at home to Burnley. Strangely, we had no staff with us, they were all on the top pitch as there must have been an important game on. However, I remember Laurie Hughes our ex-centre half was there. We were 2-0 down at half-time, the Burnley coach gives us some water and a conflab [discussion] and he even made Freddy Molyneux captain for the 2nd half. I remember with only a few minutes left, I go up for a flying header and get cramp from waist down in both legs. The Burnley trainer comes on to help me, whilst he treats me he asks if I would join them. Again, I tell him, “No thanks, sir, if I can’t play for Liverpool, I won’t play for any other league team." We ran out 7-2 winners and I managed to score. The following Saturday it was my 17th birthday and I was in the team to play Blackburn away. “Outside-right”, I had never played there before. However, I got through the game OK. I started to ask myself why they are playing me outside-right. 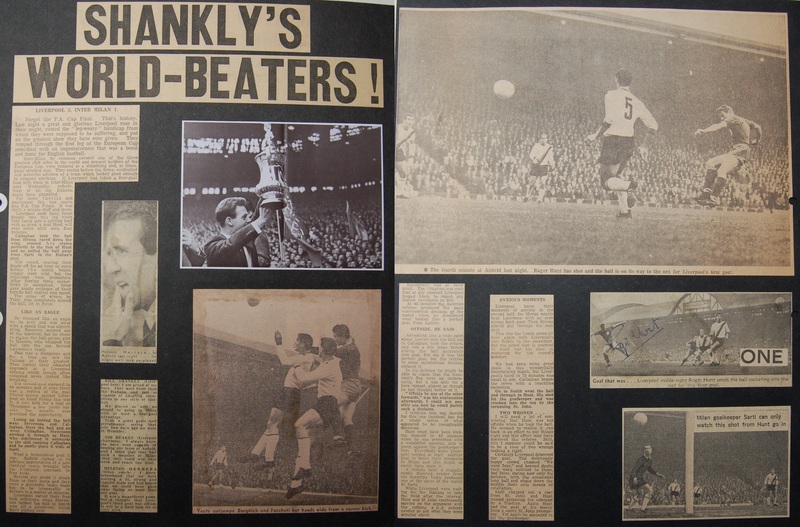 The following game I also played in that position, I remember it was away to Man Utd at the Cliff; Johnny Giles and Nobby Stiles were playing for them and I had an absolute stinker. It then became evident why I was being played outside-right. I thought back to a practice match at Melwood. Ian Callaghan, like myself was a wing half/inside forward. Cally is playing outside-right, with me inside to him. I knocked a ball, it arrived about two feet high which he instantly controls with the full-back close and knocks it back. Bob stops the game and tells everyone to stay in the positions they were in. He calls me and Cally over and tells Cally, “The back was close to you, son, just glide it past him and get to the byline.” I play the same ball; Cally gets it in one, right to the bye line. He was a coach’s dream. I now realised, that mainly five players were getting games on the right wing; Cally, Blore, Twist, Carlin and myself. Twisty was the only recognised winger. It then dawned on me that Bob was looking for a winger to take over from the great Billy Liddell. Further down the line Cally would be given that job, deservedly so as I was rubbish there! I was now back at wing-half on the top pitch and feeling I was doing OK. Half time we go in for a cuppa and slice of orange; Joe Patterson, one of the coaches, came over to me; "You’re doing fine, son, but you’re giving them the ball back a bit too much.” I was deflated! “It's not your passing though, you’re putting the ball out when you tackle, too many throw-ins, otherwise you’re doing well!” I felt better as I had learnt something. As weeks go by I'm still feeling pain, but doing contra spats before and after game, putting my damaged foot in a bowl of hot and cold water alternately. 11. WHERE’S THE OFFICE, SON? Liverpool FC is about to experience the most momentous moment in our history, Tuesday the 15th December 1959. On that very day, I went to Melwood straight from work on my bike; I was early, the only one in the dressing room. I started getting changed and sat down reading the Echo. The headlines were all about “Bill Shankly becoming the new Liverpool manager”. The door opens, in walks this guy wearing a black tracky top, shorts socks and baseball boots. Crikey it’s him, Shanks was stood there before me, what a presence! “Where’s the office son?” he asked me, "Through there, sir," I replied nervously, “Thanks” he said and off he went, my life!! He only signed last night and there he was ready for action. I had only ever seen the previous manager Phil Taylor three times, each time he was always wearing a suit and tie. What a man, Shanks; the rest is history! Bill began with a couple of bad defeats against Cardiff City and Charlton Athletic before going on a run of wins. We ended up finishing 3rd and went out of the cup to Man Utd. “Sir” Roger is now our leading goal scorer after taking over from Billy. On the 16th April 1960, the great Ian Callaghan or Cally to his friends made his debut against Bristol Rovers at Anfield. He was only 17 and I was so proud of him. On a night when I would go to see Rita after training me and Cally would get the same bus together. He lived in the Dingle and Rita lived close by. I swear to this day that, Ian Callaghan was the nicest player I have met in football. From time to time, a couple of us would be sent to Anfield for reserve games, to load and manage the kit basket, for home and away games too. When you got this duty it was said they were looking to give you a game in the reserves. Nevertheless, it was a good experience. The A,B,C youth teams would also leave from Anfield by coach when we played away. Ephraim Longworth who played 370 games for Liverpool, captaining the club as well as England! We had some fun times at Anfield in them days. I'll always remember we had to put a tanner in the meter for the snooker light; however, we would play without the light. One of Liverpool's legends Ephraim Longworth was in charge, he looked after the facilities at Anfield. He won a couple of league titles and played in the cup final against Burnley. Ephraim was in his 70s. I loved listening to his stories of him playing for the Reds from 1910-1928. Anyway, he would come running in, pick up a cue and whack whoever was nearest, “Put your money in, lads”, "Ahh, hey Ephraim, we're going to play footie now." "You're going nowhere if you don’t put your money with me, lad." All in all, it has been a good season for the Reds and myself. Bill Shankly is galvanising the fans, players and the club as a whole. He told anyone who would listen, "This will be the best team in the world." Anyone who was a red believed him and was prepared to join in the revolution of Liverpool Football Club. The 1960/61 season is above us; Frank Spencer and myself go to the phone box outside the Kop to phone Tom Bush who was in charge of the youth teams back then to find out when we had to report back for training. Frank spoke to him first and when he came off the phone, he was looking rather glum. Tom had told him he had been released, but to tell me to report back. I was gutted. Frank and I had gone to school together, we were seldom apart, he played left-back to me, at left-half and we had a great understanding of each other’s game. Frank also played for our old boys team. We had also been playing overage Sunday League since we were 14 years old. I suggested I would leave with him, he told me not to be silly and to carry on. We had dreamt of playing together in the first team, I knew I would miss him. He was the voice of this shy lad. It did feel lonely without Frank when I reported back, something was missing but I had to get on with it. Also at the start of the 1960/61 season Bob had been made assistant to Shanks and Joe and Reuben were also moved up and the Bootroom was taking shape. My ankle was still nagging away but I always to put it to the back of my mind. Another blow was about to hit, not only me, but all reds; legend Billy Liddell played his last-ever game for Liverpool. My love for the club had started with Billy. I must have had hundreds of signed pics of him. I idolised him. He worked as a bursar in the university. I was on top of the tram one day and it stopped outside the university. I could see through a window, and there was Billy, sitting at his desk, working away. This became a regular journey for me. Billy and his wife also had a sweets and convenience shop in Oakfield Road. I used to go in with my scrapbooks. His lovely wife had got to know me and if Billy was out, she would give me a time to come back to see him. He was such a gentleman. He would ask me if I played for the school and always told me that practice makes perfect. I never told him I was involved in Liverpool schoolboys or LFC. We just chatted generally about football. When I used to call in for autographs, he would always tell me he would get to home matches to chat with the fans and sign pictures one hour before kickoff. He even asked us for permission if we would allow him to leave straight after matches so that he could get home to see his family. I would never see Billy at Melwood as he was only a part-time player and had a different training schedule to suit. Billy was a justice of the peace; some mums have told me that when their boys got into trouble and Billy heard about the case, he would visit them at home to encourage them to stay out of trouble. He genuinely cared about the well being of the community. What an absolute legend of a man! As the season goes on, my ankle continues to play up so I stop training at Earle Town to rest my leg a bit more. Something I should have done much earlier to be honest. I also remember around this time Rita and I were going out with friends to the Cavern one Friday night. We stopped off at a pub. I noticed Tom Moore and Tom Bush were sitting there with friends. They spotted me; "A night before a game, son?, oh dear" and they gave me a dressing down. I only had a half pint, and assured them the Cavern didn’t sell alcohol, which it didn’t. I wasn’t a drinker by any means then, but I had sewn doubt in their minds. We were always told a drink, when old enough, after games was OK, but certainly never the night before a game! The 1961/62 season is momentous for various reasons; Roger Hunt scored more than 40 goals and my friend Cally became a regular. Moreover, Ian St. John has arrived and I saw his hat-trick against Everton on his debut under lights. I also remember travelling to Old Trafford in my mate Alan Edward's car for a cup match. It was teeming with snow; our future winger, the great Peter Thompson, scored the only goal in a defeat to Preston North End, our boss’ old club. On the way home the car developed a leaky radiator. We had to stop every 500 yards to top it up with snow; it took hours for us to get home. However, most importantly of all that season was; we won the Second Division. We were finally back where we belong. This was the beginning of what would prove us to be, the most successful and best club in the history of English Football, just like Shanks promised. Although I have struggled somewhat with my injury, I'm delighted when am invited back. I thought to myself, “They're giving me every chance” and I was very grateful to them. Nevertheless after Christmas it was becoming more and more of a struggle. My ankle kept blowing up, more so in the cold months. It was becoming evident that my ankle wouldn’t stand up to the rigors at the highest level. I was about to make the biggest decision of my life. At the end of the season I decided to tell Tom Moore of my decision, whilst holding back the tears; "I’m leaving Liverpool Football Club and I have no interest in moving to another club.” I had always said; “I would never play for anyone else, for me it was Liverpool or nothing." That never changed, I would later play amateur football with my mates but that was it. I reflected on my early days in the “spec” and the men talking about the Reds never having won the cup and my dad pointing at me and saying, “They won’t win it till he plays for them.” I wondered if he thought he had come close with that statement. After all I had played or trained with six of the team that won it in 1965. I consoled myself with the thought that I was forced out by injury and it appeared I was still wanted and had never been told I was not good enough for this level. Anyway, to this day I have no regrets. I'm proud and privileged, to have worn the shirt and played some part, however small, in Liverpool Football Club's history. I met some wonderful people along the way and learnt so much from these legends. I was indeed a very lucky lad. After a few weeks I started to come to terms with my future. It felt so strange to think wouldn’t be going to Melwood again for pre-season training. However, I keep up my fitness at Bootle stadium and have more time to spend with my mates at our old boys/girls club in York terrace just off St. Domingo Road, the place where I first set eyes on Rita. We have been planning our wedding. A friend, an ex-boxer Stan Rowan, who owned some property, gave us a basement flat in Grove Park in Toxteth for 6 months, rent free with the proviso to undertake all repairs and upgrading. Doing this work also took my mind off LFC. Rita and I got married at St. Vincent's church on Park Lane, on the 29th September 1962. Old friends Spence and Billy sorting out a few precious cups in Clark Gardens, Woolton! Within two months I came out of my time as an apprentice joiner and I was made redundant. I needed a job as we went into the worst winter on record. The 1962/63 construction came to a complete standstill. I finally manage to get a job as a bus conductor, just for the winter but I stayed on a bit longer. They had great footie facilities, my mate Frank Spencer is also on the buses at a different depot and I finally got the chance to play against him for the first time ever. We went up for the toss together, shook hands and I pat him on the back. I remember I had a sticky on “L” plate in my left hand and it went straight onto his back. Fifteen minutes into the game, before he realises, everyone started laughing. I remember I took a ball past him and down I went in the area, he whacked me, "Thanks for the pen, Frank,” I said smiling. I was starting to my footie again and I was a bit fitter than most. Although my is ankle still bothering me, the demands were a lot less at this level and I would cope for many years to come. Early 1963, mam negotiates a three bed house for us to rent in Nuttall St. off Wavertree rd. We later bought the house and spent 49 happy years there. We had our five children, Billy, jnr. Paul, Greg, Steven and Diane, in that order. I also remember the very first time I took Rita on the Kop and she fell in love with Alan A'Court. Her next crush was Stevie G, so she had good taste. The Reds are going from strength to strength; Milne and Stevenson are the wing halves. I remember taking a reality check at this point; would I have got in ahead of them? The answer was an emphatic, no chance! This thought helped me no end with my decision to leave LFC. Now I'm only a fan, but I loved every minute of it. The Brazil chants from the 1962 World Cup set the Kop choir alight, also the Mersey sound was in full swing; The Beatles, Gerry, Cilla and we all sang word perfect in unison. It was such a joy going to Anfield back then, pure theatre! Furthermore, the longest wait in history is over, we finally won the FA Cup. The 1st of May 1965 will live long in the memory of all Reds. I thought back to dad’s statement and when I trained and played alongside; Callaghan, Lawrence, Lawler, Byrne, Smith and Hunt. Four of them were local lads, now all heroes! I was so proud of them all. Four days later, we played Inter Milan, in what was the greatest game I have ever witnessed to date. I think everyone bunked off work and school that day. I got to the ground at 1pm for a 19.30 evening kick off. All the surrounding streets were already full of fans. When I finally got in there was steam rising from the Kop, and the Kop choir was in its best voice ever. Six years later, in 1971 the Reds and Blues went to battle at Old Trafford, in the semi-final of the FA Cup. We beat them 2-1 and Arsenal awaited us in the final. We all get tickets for the match, however, a fire-fighter mate of mine had recently died of a brain tumour and his mum asked me if I would watch the game at her house with his dad and brothers in his memory. I gave my ticket away and accepted her invitation. We lost the final and the following day I was a guest at the homecoming at St. George's hall. In them days we used to welcome the lads back from Wembley, win or lose. I was stood on the steps waiting for the team to arrive. I remember a gang of kids from my neighbourhood were at the front of the crowd; they start chanting, “Mr. Howard, Mr. Howard!” embarrassing the hell out of me. The reds arrived and Shanks delivered his famous speech, on the video, his outstretched arm blanks me out as the camera spans around, thanks, boss! We go in to the reception and I told my mate: “The players don’t need us sitting with them; there are enough hangers as it is, press etc." A barmaid asked me why my mate and I were not taking lunch, I told her that "The players were down after the defeat." She said: "OK, drown your sorrows with that, lads" and put a bottle of teachers and two glasses on the bar. We gladly accepted. In 1974 we are back at Wembley, just as Shanks had promised. We travel down in the van and arrive early because we are a ticket short. The Blackbird pub was closed, so we knock and the manager finally let us in. The atmosphere inside was magic, both sets of fans singing their heads off. The manager announces he has a spare ticket and he would give it to the best solo singer. One fan from each side had a go. The lads pushed me forward. A Geordie got up on a table first and belted out “Blaydon races” and then up I jump up and sing, “My way”. We won the ticket and then the cup and had an absolutely cracking day out. 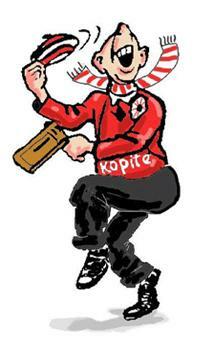 It was a joy to be a Red in them days. Shanks gave us so much more than just winning trophies; pride, belief, great players and so much enjoyment. It was a family affair back then. When Bill retired in July; the Red half of Merseyside was truly devastated. Our rollercoaster ride with Bill Shankly had now ended. How would we survive without him? At his point I'm now in my mid-thirties and I was still playing Saturdays and Sundays and watching the Reds when I could. I also get involved in junior football and decide to take my coaching badge. As my own boys leave school they joined me in teams I played in. Moreover, I start a summer charity side, boxers such as, Brian Snagg, joey Singleton, Robbie Davie's, George Schofield and Tony Carroll, as well as, ex reds and blues would turn out for us. The time came when my four sons all played in same teams as myself, if I could have melted them down, I would have had the best player in the world. In one particular game we all scored. The referee was bemused when he was taking down the scorers' names. My daughter was also into sports like my boys. Diane took up karate, and reached black belt level. I had been watching young boys ploughing through mud and combatting extreme winter conditions. Therefore, I toyed with the idea of a summer league for up to 13-year-olds. Along with my three brothers and a few mates, we got together in the Campfield pub in Heyworth Street. Everton to form a committee. Although league and cup trophies would be awarded, my main priority would be simply to help boys improve their ball skills. In my opinion, the summer pitches would help them achieve better skills and enhance their enjoyment of the game. To bypass red tape we would not affiliate to the FA as things were rather controversial at the time. Slum clearance had taken place on Heyworth Street and one side of the road had been flattened and grassed over. I set about marking four pitches out and making eight sets of goal posts. Mam and dad still lived opposite the pitches in Orient Street, so we could use there garden as storage. We coached the players two nights a week and played on Sunday mornings. In my opinion this was “common” land, but council objected to us using this land and soon put police in place to stop us playing on Sundays. They could do nothing to stop the kids, they were too young, but the adults were moved to the pavement. We refereed the games from there for a while, then we taped the pitches off and got probation officers to referee. However, the police were sympathetic and soon left us alone. Despite this, one Sunday morning I was making my way to mams to get the gear out and I saw the council planting trees right in the centre of the pitches. We waited until they went, got mam's gardening tools and replanted them at the side of the pitches. They are still there to this day! I was and still am to this day at a loss to understand why they would object to around 100 boys being taken off the streets three times a week for recreation. A certain Robbie Ryder caught Billy's eye! I was involved with various junior sides; one team I managed was Durning Colts in the Edge Hill League. One really good team in our league had a really outstanding striker and I urged anyone who would listen to come and watch this kid. Halfway through the season, my job took me to London, I handed the team over to others and I would ring home each week to follow their progress. One week I was told this particular kid had scored 18 goals against us in one game. The kids name was Robbie Ryder, soon to be the legend that is, Robbie Fowler. I was never into shelf trophy glory when I was involved in junior football my only desire was to provide a facility for kids to play footie and hopefully improve their skills. I had been lucky, I had worked with the best; Paisley, Fagan etc. and all I longed for was to pass my knowledge on. One boy stands out in my mind; he was in the park week in week out watching us play. He had a disability. I went to see his mum and told her if she got a doctor's certificate, I would sign him on and play him. She did and the moment he put his kit on and walked onto the pitch to play what was the first game of organised football at the age of twelve, which I bet he had dreamed of doing every day, was the most joyous and proudest moment of my entire football life. For as long as I live; I will never forget the look of excitement on that boy's face, my work in football was now complete. I was able to give one little boy the same enjoyment, I and many others had experienced, something his mum told me she never expected would happen to him. Furthermore, my son Billy Jr. worked for local radio and we played for their charity XI as well. My boys got to know Chris Lawler very well; he attended Paul's wedding and used to visit our house many times. Rita really liked him; “The quiet man is a gent," she would say. What a privilege it was to play in the same team as my four sons. That was as good as it got for me as my legs eventually wouldn't carry me anymore. I finally hung my boots up a couple of months before my fiftieth birthday and my time is spent watching my grandsons play now. I loved every minute of kicking a ball. I could fill hundreds of pages on my experiences supporting the Reds; Inter Milan, Istanbul, St. Etienne, 7-0 Spurs, 5-0 Everton, 5-0 Forest, the two FA Cup finals against the blues, League, European and FA Cup victories. I'm so lucky to have seen some of the greatest players ever to grace the field; not just from Liverpool but the visiting clubs as well. Especially, Billy Liddell and all the great half-backs I learnt from. It seemed I could never get away from LFC. In the early days, my mam's cousin Marty Corcoran, used to carry the board with his mate around the ground, advertising the Liverpool boxing stadium. My baby brother married Johnny Wheeler's niece. My eldest son did corporate work at Anfield some years back, and at present my granddaughter works at Anfield on match days. When Rita sadly passed away, I moved house. My current next door neighbour is Liverpool's ex. academy director Frank Mcpartland's uncle. When my four sons were little, it only used to cost us about £12 to take the four of them and with today’s prices would cost around £200 now. I think all clubs should make more room for youngsters. After all they are the future of the club and if we price them out we lose them forever. We have four season tickets in the family. I gave my tickets up so my grandsons can watch more games, but I still get to the odd cup game as I can't stay away for too long." Thank you, Liverpool Football Club.